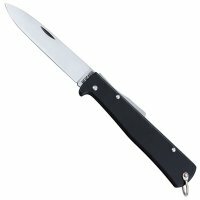 This folding knife is an icon of German knife design and has been produced almost unchanged since the era of Emperor Wilhelm II. Light and compact (only 7 mm thick) but almost indestructible, it is a reliable companion for all outdoor activities. The hand guard offers a high level of safety, even under the hardest use (e.g. carving). Handle with hanging loop. 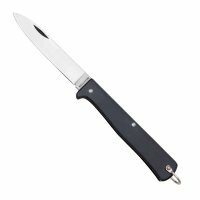 Carbon steel achieves ultimate sharpness and is easy to sharpen, the blade must be regularly oiled. Rustproof steel is easy to care for, however, due to the high chromium content, it is not as easy to sharpen.